Our aim is to ensure we find the right PCA for you. Someone who can fully meet your care needs and improve your quality of life. We always make sure we are clear on your particular situation, needs and wishes. We discuss this and agree these so as to ensure we find and introduce you to the right help. You agree with the PCA the hours and time you need them to be there for you. From live-in care to regular daily or occasional visits they will arrange their schedule around your needs. You will find them flexible and reliable as well as professional. Treat all those you care for as though they were your own family. Be adaptable, professional and reliable at all times. Communicate clearly in English so you know and understand your client's wishes and needs. Work hard, be patient and honest. Always take pleasure in providing help to those you care for. Maintain the dignity of those you are helping and ensure they feel safe in their own home. Make it possible for them to enjoy their community to the full and show they are never a burden. Always aim to make significant improvements to the well being of all those you care for. Take humility, as well as empathy and joy with you at all times. Always show your highest respect and view it as your privilege to give your help in any way possible. Caring is our ultimate goal, as a profession. It is not just a job. Marinella (of Filipino Carers) has been helping me with my autistic daughter, as I have rheumatoid arthritis. She is an excellent carer and I would welcome her back anytime. 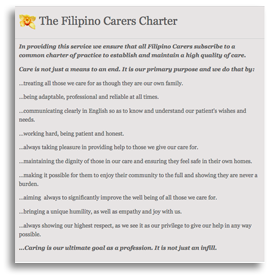 Myra – the PCA from Filipino Carers is sure of herself, which is reassuring. I like her very much, she is willing, helpful and doesn’t just sit around. She finds jobs to do. Divine is very capable and proactive. She tackles most tasks with enthusiasm and eagerness. Overall she has proved to be a great help and has fitted into the family dynamic well.